In this case, the homeowner had already replaced the roof three times, seeking to cure an ongoing leak. The roofing contractor was now recommending that replacing an upper section of the roofing would fix the leak, but the owner wanted to try our services first. When we arrived, we found the usual assortment of buckets on the floor (A). After talking to the owner about the problem, we turned on our camera and went to work. As you can see in the photograph (B), there is a slight bulge in the drywall ceiling but no other signs of moisture. The moisture meter, however, read off the scale when placed on this spot (C), and an IR image (D) shows a concentration of moisture. The root of the problem turned out to be poor roof design (E). In heavy rains, water from an upper roof cascaded onto the lower steep-slope roof, where it was directed back against the building and in around the poorly executed counterflashing on the wall, eventually finding its way into the living room ceiling. Our recommendation was to install a new wide cricket flashing, taller counter flashing, and gutters on the upper roof to redirect the bulk of the water. Sometimes IR scanning is a nice complement to an investigation as in the case here. This home, located in a coastal community in Calif., was eight months old when we were called in. Like many coastal homes, it had a wall of glass facing west, which bore the brunt of the storms coming off the ocean. The owner had complained that water was always coming in at the floor along the double glass doors. The builder had tried several times to fix the problem, replacing all the weatherstripping and re-caulking every possible entry point, but nothing had worked. They heard about our infrared and water-testing services and called us to determine the cause. After getting up to speed on what had been done, we used a hose to perform a water test (A), strategically taped off areas to confirm our suspicions of entry (B). Before long, water was coming in under the door, as both the visual and infrared photos show (C, D). When we opened the door, the IR scanner quickly picked up something that might not have been obvious — the water was flowing out from inside the bottom corner of the door (E). The problem wasn’t the caulking or weatherstripping, but a missing washer at the door hardware that allowed water to enter and run down through the three point locking mechanism. Note the rust spot (F) where the water travelled. A general contractor called, saying he believed he had a roof leak in a house he had built and asking me to take a look. I found a patch of blistered paint on the return wall of the home’s main staircase (A, B). Moisture readings confirmed that the wallboard in the area was damp (C). A bathroom upstairs might have been the likely culprit, but the builder had already repaired leaky supply pipes a few months earlier, so now he suspected the roof. However, the initial IR scan (D) showed a pattern of water under the bathtub, so we figured we’d start there. We turned on the hot water and let it run, then set the camera on timelapse mode and began scanning. In a couple of minutes, the water began to show up as a bright yellow streak coming down the corner of the wall (E). (You can also see the hot-water supply pipe running up through the wall to the left.) Then gradually, as the wall was saturated, the hot water filled in beneath the tub (F, G), which turned out to be the source of the leak. As this case illustrates, the moisture stain is often in a different location than the leak, because water will always follow the path of least resistance. The great advantage of the infrared image is that it shows the path, right back to the source. The chief engineer of a major upscale hotel chain called me to say he thought they had a problem with mold in a few of their suites in one of their hotels. We talked about the project, I sent him some sample infrared images of moisture in walls and a proposal. He accepted my proposal. The IR work was to be done on the weekend when occupancy was low. I agreed to survey on Saturday and Sunday and he would meet me on Monday morning to review my findings. Upon my arrival, the hotel maintenance man gave me the list of rooms which they thought I would find moisture and mold. The list had 200 rooms on it with X marks on 10 of the rooms. 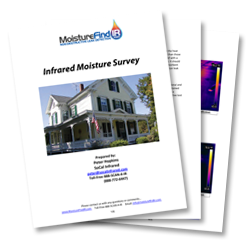 The purpose of this survey was to perform a general infrared survey of moisture in the walls of the guest suites. During recent replacements of the guest room air conditioning (AC) units and by observation of pink stains on the walls by the hotel staff, mold was found to be growing on the sheetrock walls, behind the wallpaper. Because mold needs moisture to grow, we are often asked to find moisture as this will give indications of potential building degradation -like mold, mildew and rotting. We usually find that entrained moisture is caused by thermal envelope, moisture envelope and air barrier problems, or an unbalanced HVAC system, or by water leaking in directly from cracks, holes, or gaps in the building or a combination. On Monday morning we sat down to review my findings. I handed him the list of rooms with a big X covering the whole sheet and said, “Sorry, it’s every room”.